Before we moved into the house, my bedroom was a place for me to escape the world, even if it was only for five minutes, sometimes even two! Everything was on the same level, and I know Spud was just a few steps away from me, I would lay on my bed, close my eyes and just escape to another world. My bedroom at the flat wasn't a dream bedroom, but it was my bedroom, my safe haven! I loved my bed, I loved the plain white walls, filled with pictures of memories after memories and I loved my huge rose canvas! The carpet had been down for a good few years, it was the first and only carpet I brought for my bedroom, instead replacing Spud's carpet every now and again. So my carpet was brown, colour schemed for the brown and cream theme I first had, then I changed it to purple and cream, and the carpet still stayed, then I changed the room to a white, black and red theme and the brown carpet still stayed, but I still loved that room, and still enjoyed every single second in there. Now at the house, I feel like I don't have no where to escape too! I've mentioned before how relaxing my bathtime moments are, and how I cherish every single second spent in the bath time, relaxing, de-stressing and reviving myself, but I can't even do that here, literally every room bar the front room is in ruins, and is leaving me feeling down. To make myself feel better, I'm writing this very post alongside working on a mood board, I'm tired and want to escape to my bedroom, but I'd rather lay on the cold laminate flooring in the front room then lay in that bed wide awake (because I've not got no time to sleep! ), the thought of staring at the walls and floorboards is enough to put me off! There's five things that would put me in a much better room right now if they was in my bedroom! 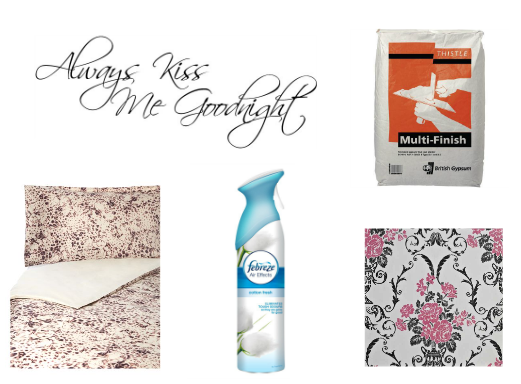 My mood board below, features what my final five for that bedroom is! The carpet can wait, so can the rest to be honest, I just need something to look forward too! I live by quotes, I have so many quotes to throw out in any and every situation, so to have this quote above my bed in my bedroom just fits me and my lifestyle perfectly! A new bedroom and a new bed is the perfect excuse for me to browse the linen section obviously! Every time I check out the range, I fall in love with a new set, and leopard print and I are just meant to be! I need this set in my life, well in my bedroom should I say! 3: Fabreeze Cotton Fresh Air Freshener. A random item to add I know, but this is such a beautiful scent I could literally smell it all day every day! The white shabby chic theme I plan to have would go great with this scent available to buy at Tesco and other leading supermarkets, because I think of things like that! At the moment, I only tend to go to my bedroom for bedtime, and even that has to be at the very latest, when I'm literally holding my eyes open to climb the stairs for something I need from my traditional alcove wardrobes, my favourite piece of furniture in my undecorated room! Before anywhere even gets started on in my bedroom, the walls and the ceiling needs to be re-plastered! Luckily my little brother is a professional plasterer, and my oldest brother is in the plastering trade also! I've got two massive ceiling repairs where someone has come through the ceiling and so you can imagine the state of it all! I know one day this place will be home, and I'll be able to show all of you before and after photos! Hopefully then the words will become clearer, as you will all see what I witness with my eyes every single day!